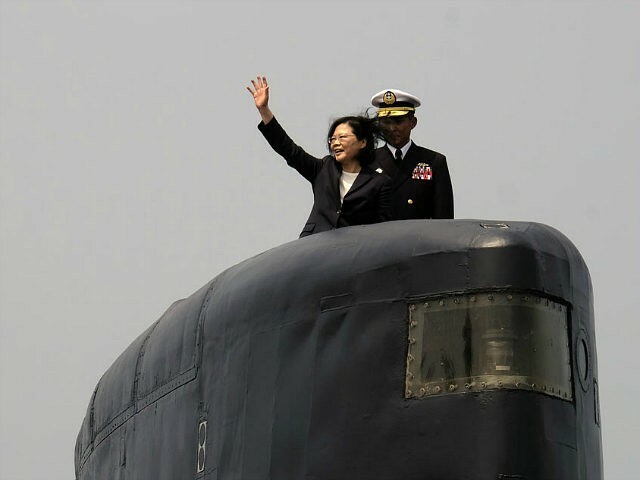 Taiwan’s President Tsai Ing-wen announced Tuesday that she was approving a new plan for the island nation to build an indigenous submarine, following years of failing to get foreign nations to agree to sell submarines to the Taiwanese military for fear of upsetting the Chinese Communist Party. “I want to tell you all that the Taiwanese always face challenges bravely and overcome them,” she continued, calling her announcement a “historic moment” for Taiwan in the face of an increasingly hostile neighbor in China. China does not recognize Taiwanese sovereignty, considering it instead a rogue province. China demands all foreign nations who seek diplomatic relations to accept the “One China” policy, or refusal to recognize Taiwan’s sovereignty, as a prerequisite for any ties to Beijing. China’s relationship with Taiwan’s allies has consistently prevented Taiwan from expanding its submarine force. According to Bloomberg, Taipei has spent over a decade attempting to secure a contract with the United States for eight American submarines but failed to convince American officials to go through with the plan. Taiwan has experienced similar frustrations with European sellers of military assets. Tsai used these setbacks to argue on Tuesday that Taiwan’s only choice on the matter is to build its own fleet of submarines as China has ensured no country will sell them any. The Agence-France Presse reports that the Taiwanese government is expecting the project to take eight years, with the submarines expected to become active military assets in a decade. They would join another four submarines that Taiwan currently operates. In comparison, China has 53 known submarines operating currently. Bloomberg reports that China appears to be seeking to expand that fleet to up to 78 submarines, according to a Pentagon estimate. China has also claimed almost the entirety of the South China Sea for itself, including the sovereign territory of Malaysia, the Philippines, Vietnam, Brunei, and Taiwan. As it does not recognize Taiwanese sovereignty, any claims Taipei makes in the region, Beijing claims as evidence that the region is legally China’s. International courts have wholeheartedly disagreed with China’s claims. Taiwan’s new submarine project was announced shortly after the nation’s defense minister revealed a new annual defense budget that would expand its fleet of fighter jets significantly. Defense Minister Feng Shih-kuan told the nation’s legislature that Taipei is seeking modern aircraft in addition to the two decommissioned American Oliver Hazard Perry-class frigates it purchased from the United States this year, which left on their final voyage to Taiwan on March 9. Feng is seeking to increase the nation’s defense budget to $11.4 billion. In response to his demands, as well as to reports that the Trump administration is considering selling more weaponry to Taiwan, the Chinese Foreign Ministry reiterated that it “opposes US arms sales to Taiwan, this is consistent and clear-cut.” Chinese propaganda outlets, such as the routinely belligerent Global Times, have also urged Taiwan to abandon any hope of being recognized as a sovereign nation and refrain from developing its military. Feng also confirmed this week that China has deployed ballistic missiles to its shores, now capable of targeting the island.